I came back and started to plant some of my plants. I got through a few of them, before realising it was 12.00 and we had 1.00 Sunday Dinner reservations in Manchester. On our way to the restaurant (Bridge Street) we walked past the Town Hall. There was a stage set up in front of it on the square (where they have the Christmas markets), chairs etc. We couldn’t figure out what was going on. So nosy Liezl asked one of the attendants. 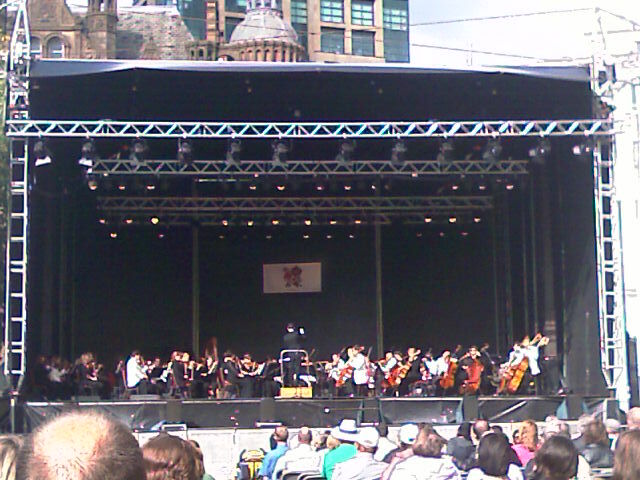 Oh, it was the hand-over to London for the 2012 Olympics, and the Halle Orchestra were putting on a free show from 1.30 pm. We decided we would come back after lunch. After lunch we did go back, but the Halle Orchestra was ‘on a break’. Nothing was going on. Eventually some people in red t-shirts arrived on stage to encourage “Sing Manchester”. They were trying to get the nation to sing. Apparently a similar event was being held at a number of venues around the country. We all sang “how much is that doggie in the window”, and i learned that it didn’t have just one one verse! I will have to learn the other verses now…! Two songs later, and the Halle did indeed come back. It was a lovely afternoon. The sun had decided to pop out every now and then. When it did, it was lovely and warm. When it disappeared, it was decidedly chillier. But a very very pleasant afternoon. We get home around 6-ish. Luckily I needed no dinner after the big lunch, so I caught up on a few episodes of South African TV while knitting. I have a deadline to knit something for someone I know, so I knew I had to get cracking! Thereafter I rung up my dad in the evening as I had missed them yesterday. By the time I finished chatting to him, it was time for “Britain from the sky” or something like that. Very interesting documentary. And now I am in bed. So, do you understand when I say I am busy with ‘things’, but I don’t really have that much to show for it?